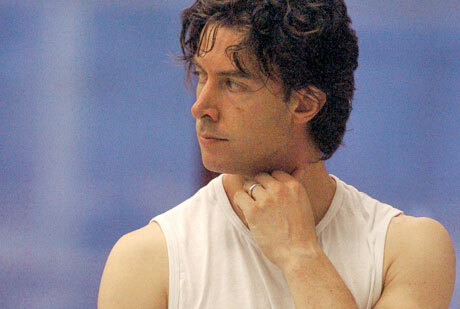 Birmingham Royal Ballet Principal Matthew Lawrence. © Roy Smiljanic. One of Birmingham Royal Ballet’s Principal dancers, Matthew Lawrence, is currently just as busy in a gymnastics hall as he is on the stage as he works on his latest exciting creation – a routine for the Welsh and five times British champion gymnast Frankie Jones for the Rhythmic Gymnastics British Championships ahead of the London 2012 Olympic Games. Born in New Zealand, Matthew Lawrence has been a Principal dancer with Birmingham Royal Ballet since 2008 where he is a hugely versatile artist, performing a huge breadth of roles within the Company. Matthew has recently spent many hours rehearsal time with Frankie at the Gymnastics and Martial Arts Centre (GMAC), which is part of the Alexander Stadium in Perry Barr, Birmingham. 21 year old Frankie Jones, the only British individual rhythmic gymnast to compete at the 2012 Olympics, lives in Northamptonshire but has been training in Birmingham ahead of the Rhythmic Gymnastics British Championships and London 2012 to work with Matthew on her new routine, as well as Birmingham Royal Ballet’s Body Conditioning Instructor Jennifer Mills. Matthew and Jennifer will continue to work closely with Frankie in the run up to the Olympic Games, as they will teach Frankie ballet classes as part of her preparation for the competition. He continued: The routine is about dealing with the transitions of life. Frankie and I are kindred spirits in this respect, as we’re both nearing the point of transition in our life stages. The piece has a melancholic tone, spiked with hope for the future, yet tinged with trepidation of uncertainty. Rhythmic gymnastics is a combination of gymnastics and dance and its origins lie in a wide variety of disciplines, including classical ballet, and the sport is rapidly growing in popularity in the UK and around the world. Lisa Higgins, Frankie’s rhythmic gymnastic coach commented: Frankie and I have certainly gained an immense amount of support from Birmingham Royal Ballet, from both Matthew Lawrence who has choreographed Frankie’s routine for the Rhythmic Gymnastics British Championships, and from Body Conditioning Instructor Jennifer Mills. Frankie has reaped the benefits and we hope that we can continue to have a link with Birmingham Royal Ballet in the future. Frankie will perform Matthew’s choreographed routine at the Rhythmic Gymnastics British Championships on 29 June in Stoke in Trent. The four days of rhythmic gymnastics competitions at the London 2012 Olympic Games in which Frankie will be competing take place between Thursday 9 and Sunday 12 August at Wembley Arena.